Serve your signature sauces with ease using this 1.5 oz. stainless steel round sauce cup. Whether it's ketchup accompanying french fries, dressing on the side of a salad, or your signature sauce to add to a sandwich, sauces are an integral part of a meal. This sauce cup provides a simple, cost-effective way to serve these necessary condiments to your guests and is a great alternative to wasting disposable products. Use this round sauce cup in your casual restaurant, diner, or bar by pairing it with a matching fry cup for a simple, classic presentation. This product is Very durable and attractive looking. I plan on using them to store sauces in when i serve food to my guest who come to visit. THESE ARE PERFECT! Perfect portions, they look like more, but hold less. Less waste, less cost. We ordered these to replace our 2oz plastic disposable souffle cups. We use these for all of our side sauces and they work well and look very nice also. No complaints from our side. They are dish safe also. Great value, Perfect size for sauces on the side without additional waste. Holds up well to washing and offers a nice presentation look for sauces. These are strong, hold up well and look good. We use them to add sides of jam, salad dressing, butter, etc. to a dinner plate, without having to waste a disposable product. Simple, yet elegant. Super easy to wash, light-weight without feeling cheap. A great value. The size is just right for ketchup, tartar sauce, if you're not charging for it on the side. Also just right for sides of sour cream or guac. These 1.5 oz. Stainless steel round sauce cups are the perfect size. They are easy to clean. They look nice and classy and not cheap. This is a great choice for a condiment jar. Would like to use it for dressings and different sauces. They are very easy to clean and barely take up any space on the shelves. Need to serve small portions of ketchup or dressings this is the one and if its for sea food looks really great i love it perfect quality!! These sauce cups are durable in the dishwasher and can hold the perfect amount of sauce or dip. They do not rust or scratch so they are long lasting. I have several sizes of this stainless steel cup and find they are high quality and very attractive. The uses are endless and they clean up beautifully. Great price, great product. The perfect serving size for condiments & sauces, lessens waste & easy portioning to control costs. Love the small packs & the super fast shipping. Love these little things! Perfect for sauces or letting customers sample your products. Easy to clean and very durable products. I like that they are solid and stainless steel. Solid, sturdy little cups. Fits the perfect amount of ketchup without wasting it! No rust after many washes. These look a lot classier than paper or plastic ramekins! the perfect size for small amounts of sauces, relishes, jams & chutneys. these are lightweight, so make sure you place them between two dish racks when traveling through an automatic dishwasher or they will end up at the bottom of the drain. great value here. I got these to use for small ingredient prep, to use with dip or catsup and melted butter for seafood. A side note, kids love having their own small size cups for small amounts of food. I can say this is the best putchaces i made from This side, should have use this one long ago, its actually looks better than the pics, perfect size! And even make your dishes look fancier! There is nothing I don't like about this 12-pk 1.5 oz sauce cup. It is great for sauces, dips,and small portions of food like my daily dose of salted almonds. The finish on them is a very consistent polish. Very good quality at such an economical price. Thank you to Webstaurant for offer wholesale pricings to residents like myself. This nice 1.5 oz sauce is cute and reliable. We use as dipping sauce box for our customer . Very light weight . We love it . We might order it in 3 month . These cups are very cute and a good size. The problem we have with them is that they have rust spots on them and marks. The flared side adds appeal to the otherwise industrial looking ramekin. These are the perfect size for condiment and match with any style of dinnerware. The perfect size for any condiment! We use these with almost every food order that comes out of the kitchen window! Great Product, highly recommend! These are perfect for our sides or salsa and sour cream or extra sauce requests. Easy to clean out and the seams don't pull apart. We used these to hold butter pats for our waffle brunch and they worked great and are just the right size. Easy to clean too! We use these cups to serve our salad dressing on the side and they are perfect. Keeps the employees from giving too much dressing which helps keep the cost down and reduces waste. Absolutely perfect. I really like these. A good sized cup that will last forever. These are cheaper than some disposable cups and the stainless makes them easy to clean. They also stack well. These little stainless sauce cups are definitely a bargain. I use these for holding pre-measured ingredients (i.e., salt, dried seasonings, soy/fish sauce), which makes things so much easier when I'm ready to actually start cooking or mixing ingredients. I also find these little cups perfect for individual dipping sauces (ketchup, cocktail sauce, etc.) These little cups are definitely a great value! These 1 point 5 ounce stainless steel round sauce cups are really nice. We use them to steam our rice cakes with. We can also use them as portion or as sauce cups. They are well made and have no problems with them tipping over. And they wash well in the dishwasher. Everything is good with these things. These little sauce cups work great for a homey diner feel as well as a sleek contemporary feel. They are the perfect size for a side of sauce, and clean well in a commercial dishwasher. These little ramekins are sharp looking and stay clean. Water spots and finger prints do not show. The only thing I do not like is they stick together and are hard to get apart when washing them. This sauce cup is very inexpensive and clean looking. We like the simple design. The 1.5oz capacity is perfect for small amounts of condiments and other dipping sauces. This produce is quick to clean and works great. Perfect for sides of sauces! People rarely use it all if you use the larger size ramekins to it generates less waste. Also perfect for dressings for side salads. Great size for sides of ketchup, tartar, soy etc. they are shiny and fit well on plates. The price is very competitive and we will be buying more of these for sure! Well made and attractive design. The price is amazing for the build quality and they look great on a plate or in a buffet line. Great product! This is a standard stainless steel condiment cup. We use ours for syrup to go with waffles at our coffee parlor. Easy to clean and stack. These sauce cups are fantastic! The stainless steel means they're pretty much indestructible, so they'll last a long time and are really easy to clean. This twelve pack of one and a half ounce Stainless Steel Round Sauce Cups was exactly as I expected. The weight is great for stainless steel but it doesn’t feel too heavy. I have not noticed any sign of wear at the edges as I have experienced with many other brands. This treat is a must have for any kitchen for sure. Very durable and would recommend. Stainless Steel Sauce Cups are a staple anywhere you go! Restaurants and homes a like. I have used these for my event planning business and also use them almost daily at home. Make great spice cups when cooking (along with the larger sizes depending on what the recipe calls for). My daughter thinks shes such a grown up when i give her these with sauces, but little does she know, they are all but indestructible. Have held up great to washings. So affordable & so effective. great product! We have really liked these sauce cups. They are really nice looking and are easy to keep clean. Our guests like them and they offer just the right amount of sauce. These are great sauce cups. The price you pay for 12 is almost unbelievable. They look very modern when served next to a meal and I have no complaints. These sauce cups are absolutely fantastic. A whole dozen comes in the pack, so these are perfect for all of your side sauce dipping needs! I love these sauce cups. What a great price for a large amount. They are wonderful for dipping sauces like ketchup or even small servings of salsa. These are a great alternative to traditional china ramekins. These are very durable, rarely break, and when they get thrown away they are cheap to replace. Nice size cup for condiments, etc. This particular cup provides a wider base so it's easier for the customer to use to dip fries, veggies. These 1.5 ounce stainless steel sauce cups are very durable and perfect for ketchup or other sauces that you will be serving on the side. The value is hard to beat as well. Get saucy with these outstanding sauce cups they work very well and hold up for the price they are the best thing you can buy they look good on the plate . These stainless steel round sauce cups are awesome! We used to use an oyster cup for side sauces but noticed a lot of the sauce was being wasted. These 1.5oz cups are a perfect size for the sides and have paid for themselves in food cost savings over and over. They were perfect for the ketchup and other condiments. Easy to toss in dishwasher and hold up well. These sauce cups are just the right size. Absolutely amazing sauce cups. They can be used for serving everything from dipping sauces next to fries or salsas with tacos or chips. And they're pretty. Sturdy quality & these are the perfect size for ketchup or BBQ sauce. We use them for dressing for side salads also. We have eliminated a lot of waste since switching to this size ramakin. The 1.5 oz. 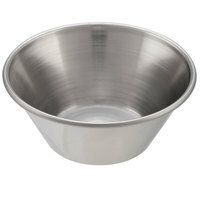 Stainless Steel Round Sauce Cup is perfect for dipping or salad dressing on the side. The quality is great as well as the price. I would definitely purchase again if needed and recommend. Great value! Very good quality -- excellent value for the price. Small enough to easily fit on a plate without crowding out the entree or side, and large enough to hold enough dip/sauce for a standard serving. The perfect portion control. This low profile product works well for plating sauces in a cup directly on the dish. Reduces waste, and the stainless is durable and easy to clean. These little cups are great. They are pretty inexpensive, and they allow for portion control for sauces, sides, etc. We have lots of them stocked up in the kitchen. I LOVE little things with big influences and these fit that shoe to a "T", I have tons of dipping sauces that needed the perfect fit, not too much, not too little, and these were it! these are small but not too small. The price is great and I am pleased that they are stainless steel. These are good for individual sauces, salad dressing, and more. These cups are the perfect size for wedding appetizers. I placed cookies, egg rolls, and candies inside them. Put a few flowers for decorations and watch the compliments come in. These are convenient and nifty! Great for dipping sauces. Since they are not on your food plate they ensure your sauce will not be all over your foods you don't want sauced up! These little cups are awesome! They're well made and actually have a nice weight to them considering how small they are. No sharp edges and they look great. I use them for sauces, condiments and even ingredient bowls for baking and cooking. They wash right up with no problems. Highly recommended. I use these and the 2.5 oz cups every single day. They are great not only for sauces but also as prep / ingredient bowls. They make portioning out small amounts of herbs, spices, chopped garlic, etc a breeze. I absolutely love them. Wow what an unbeatable price for the quality and amount! These sauce cups are great. Strong and durable and look very nice when on display. These things are the best things for a restaurant. If you can keep up with them during the washing process, then you're golden. We just keep our hands on them. But for the price you can't beat them. The customers love them and since they are 1.5oz versus standard 2oz you save a half ounce per cup so that helps the bottom line. These cups worked out great for our clarified butter for a seafood feast. They cleaned up well, look great and stand up to dishwashing. They also work well with cocktail sauce as an addition to the plate. Perfect for side sauces or any condiment. We use them for our homemade mustards and cheese sauces. Very durable and clean very well in the dishwasher! Perfect sized cups for condiments. Stainless steel always looks good and keeps it classy. Easy to clean and just the right size. We use these for everything! We go through these like water. They are small, so they get thrown away A LOT. Thank goodness Websteraunt has them for an incredibly reasonable price! Really, these are rock-bottom. Not the heaviest gauge, but they don't need to be. Pretty standard condiment cups. We prefer these over plastic because we think they look better and last longer. Easy to clean, hard not to get people to throw away. The price is right and we would buy these again. These cups are perfect for salad dressings on the side. The stainless look adds a touch of class to the plate. Easy to clean and durable. These little cups are the perfect side to get fresh seasoning ready to cook with. You out all your seasonings in different cups and then when you need them they are sitting right next to you. Helps to keep you organize while cooking. We love these. So much so, that you had ordered the many times because her customers love to steal them, too. They wash it very well, and are perfect for condiments and salad dressings. I love having the stainless with these… much nicer than plastic ramekins. I love these little 1.5 oz sauce cups! I'm trying to eat healthier snacks so when I get the munchies I'll grab some lettuce and put my salad dressing in these cut little cups so I can dip my lettuce and munch away. I actually purchased these for food prep; great to have several (a whole dozen) to put the spices in that I need for a recipe. Lol, I even keep one with my morning medication that requires drinking ONLY water and taking on an empty stomach. This keeps me from going through many glass cups during the week. Very durable construction and visually pleasing to the eye. These don't break like porcelain. Has a tapered wide mouth which makes finger bowls a thing of the past. Awesome sauce cups for great price. I use these as preparation bowls for spices when cooking, i also use it for getting sauce for my lunch, it is short enough to fit in my lunch box containers for dips . Bought several of these to use for our wedding. I was very surprised about the quality. They are very durable and could see them being reused for many occasions. I really like this sauce cup size as in bigger sizes there is a tendency for waste. In most cases people use half of a 2.5oz container of ketchup, mayo or any kind of sauce. So this size prevents you from wasting large quantities of sauce at the end of the day. If people want more, send them an extra. Apart from size, it is made of a sturdy metal and is easy to wash. This size ramakin is perfect for a side salad dressing, ketchup or bbq sauce. Sturdy quality & easy to wash (they do clang around a bit in the dishwasher). Really great! I'm using these to portion icing and fillings for my tasting appointments with clients. I look for every opportunity to stand out and present things professionally, and these help accomplish that! Seems to be a good product but could not stop staff from throwing them out. We have switched back to plastic until I can figure out how to solve that problem but would recommend them to anyone. The sauce cups are sturdy and easy to wash with occasional scouring with steel wool to bring back the shine. They don't chip or stain. They stack very well and conserve a lot of space compared to the plastic ramekins we used to serve in. The only downside is they can hold a lot of moisture when stacked so they need to dry completely before being put away. Overall I couldn't think of a better, more practical product to serve sauces in at a restaurant. Great product. Great price. I had several sizes and bought another along with this one. I never run out of uses for a stainless steel sauce cup/ramekin. Heck, I have even used these turned upside down as legs for a make-shift bain marie in a roasting pan with another pan set firming atop of them. Buy it. Great ramekin. Sturdy sides and rim. Great size for small dressings and small side items, such as lemon slices. Washes easily. Good price. Will order again. Great and very easy to clean up, we use these for our different sauces and spices. It makes the dishes look very appealing and the customers love them! When making french toast sticks or pancakes you can use the 1 .5 oz. Stainless Steel Round Sauce Cup to serve butter worth syrup. The sauce cup works great for dunking the french toast sticks. Perfect for ketchup, bbq sauce, mustard and other condiments. I have also been known to use them to hold ingredients that have been measured or prepared. High quality cups. Although, it says sauce cups, I used it as a mold for my bite size deserts. The size is just the right size for small servings for my deserts. With these sauce cups, I have minimized food that go to waste because of large servings. These are great, simple sauce cups! I use them for residential purposes, and I love them. They wash great in the dishwasher, and stack nicely for storage.